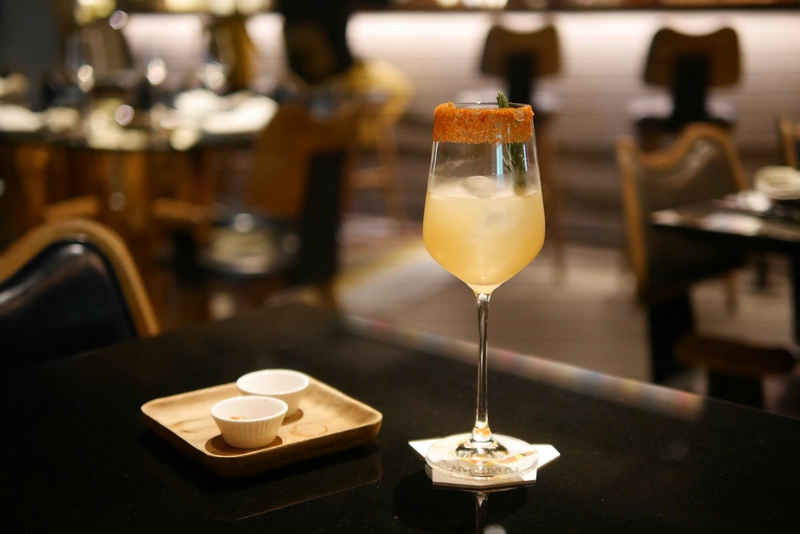 Most new restaurants can’t claim the heart of the average demanding Hong Kong customer. We love new things, but it’s also gotta be a little unique, something we can’t get elsewhere and of course so deliciously interesting that it makes us go “wow” or “ooo” or “mmm mMM”. Nothing less is adequate. So I was pleasantly surprised to recently come across as many as three new restaurants – Belon, Okra and Vanimal – which I loved and can recommend to you all with conviction. They’re not exactly 10/10s but follow the must order dishes below, and you won’t go wrong. It’s no surprise that Black Sheep Restaurants is behind one of the hottest new restaurants to open up lately. They’ve done a number of successful ventures before that I personally love, with Le Garcon Saigon and Carbone being among my favourites. 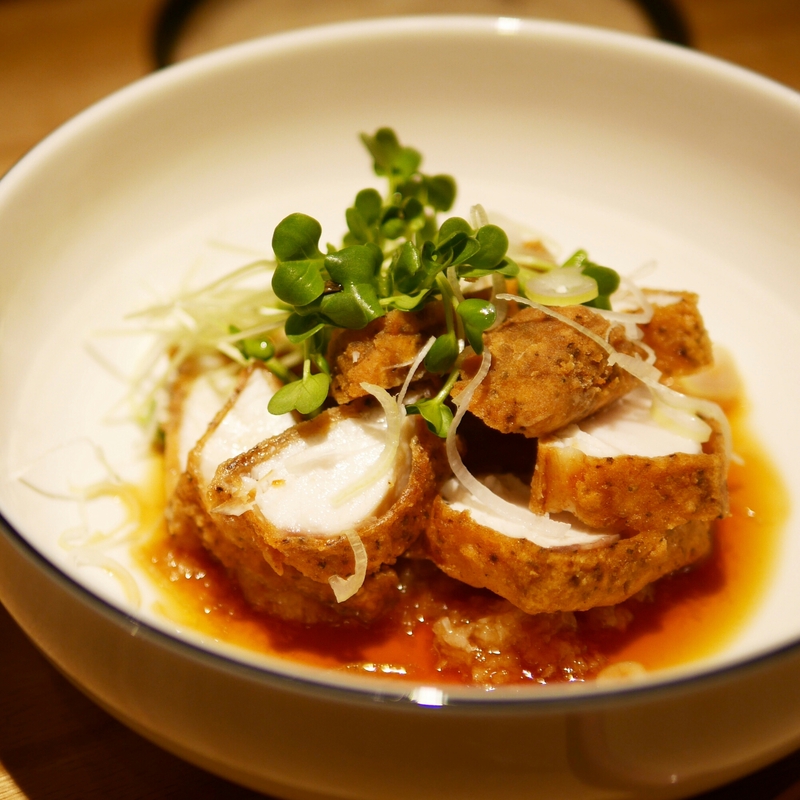 Belon is a nice little French bistro with a modern fused cuisine, but you’d need to take a closer look at the food on offer for a better idea of what I mean. The food: The menu was short. 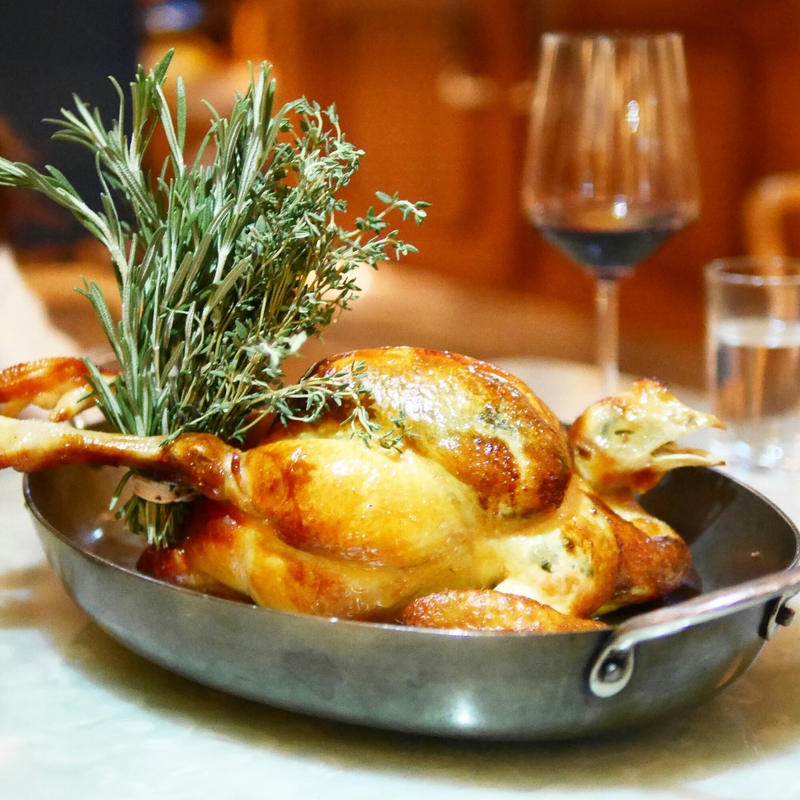 We heard good things about the Roast Chicken with Pommes Anna (HK$538) and really wanted to order this but were told the portion is for 3-4 people. Sirloin and pithivier (a pastry pie with veal in it) were among the other suggestions and since these didn’t sound super appealing to us, we ordered the supposedly epic chicken between two. And I’d absolutely recommend the same. The chicken was in the oven for the perfect number of minutes; the meat was extremely tender and juicy. The meat was also flavourful, and the chicken was stuffed with a really outstanding stuffing, consisting of spinach and chicken liver. 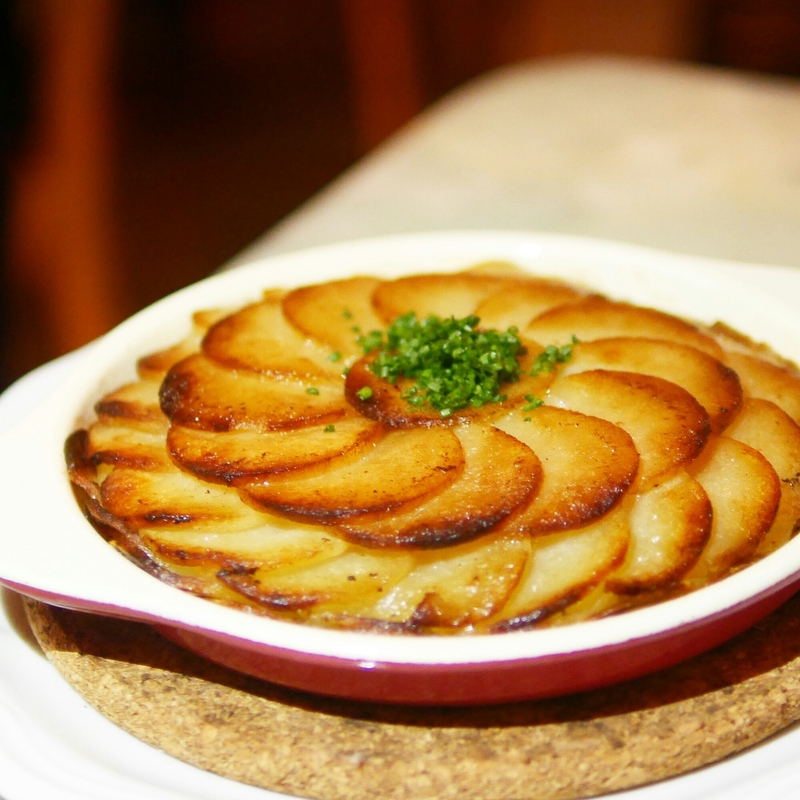 The pommes Anna on the side was also equally impressive, both in terms of looks, taste and texture. It’s a combo so good that it’s worth coming for this alone. And yes, it’s do-able between two people. Because the chicken was meant for more than two, we refrained from ordering too much else. 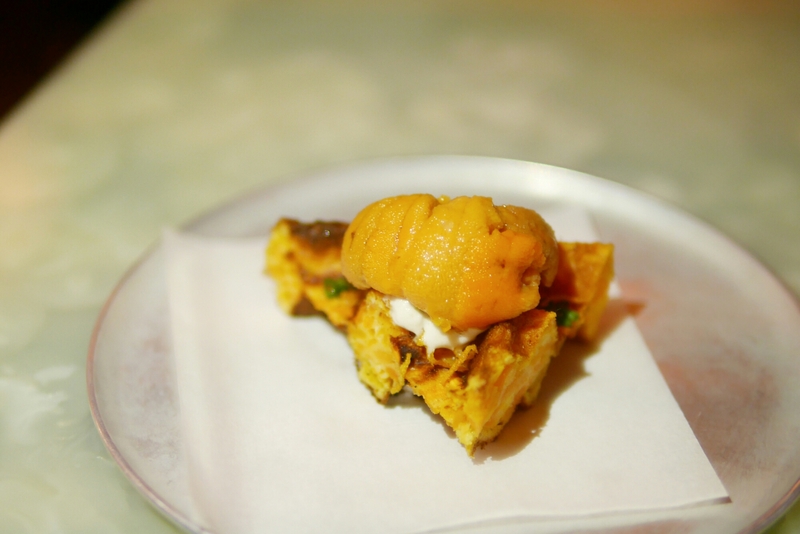 But we couldn’t not order the signature Sea Urchin on Sweet Potato Waffle which has been making the rounds on Instagram. At HK$78 piece, the portion was even smaller than the pictures depict. It was not bad but I think I was a little distracted by how ripped off I felt. We also got the Hokkaido scallops (HK$118 per piece), which was good. 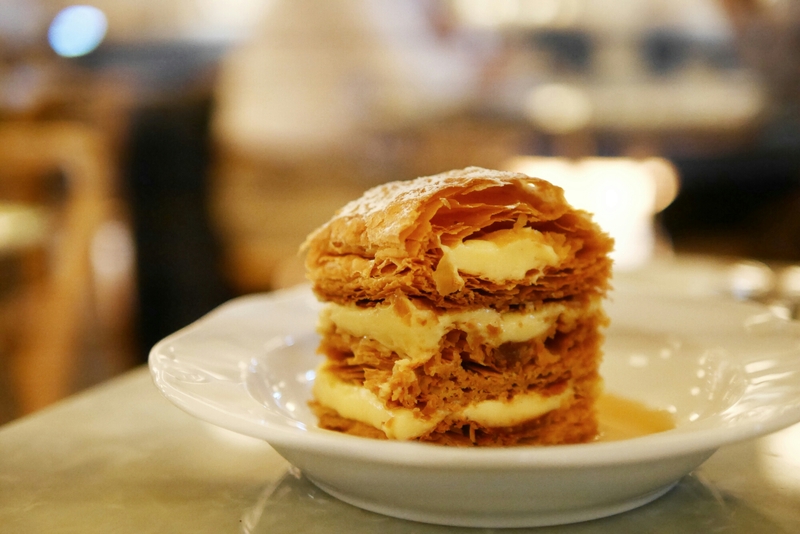 The Mille Feuilles (HK$118) was also satisfying and done well. It had a pretty good ratio (could be even higher – personally) of custard to pastry and I’d also recommended this. 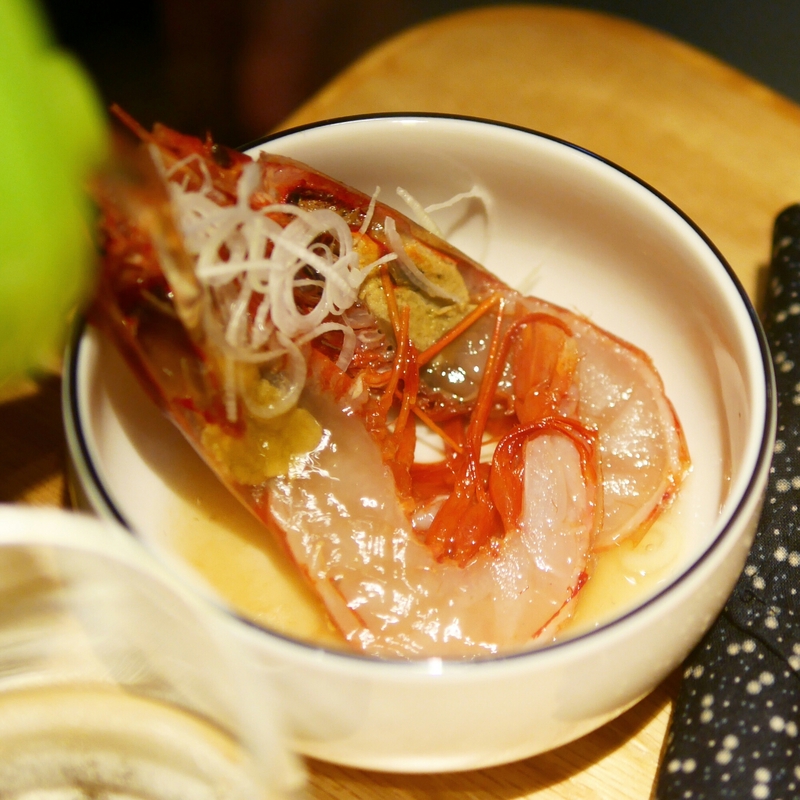 Bottom line: The dishes are pricey but the food is generally delicious. Ordering the roast chicken is a prerequisite of being impressed here. Situated in Sai Ying Pun, you’d expect this to be a cute little hipster spot, and while the decor is very hipster-y (seating is either by the bar or on high tables), Okra takes their food extremely extremely seriously – they are proper professionals in what they do. They serve modern Japanese cuisine; things are pretty fusion-y here. The food: I was glad I did some research on Okra ahead of time because the menu is packed with mostly super intriguing options. It takes a bit of time to decipher. Most of the items sound unique and it’s a little difficult to know what you’d enjoy. The Carbinero shrimp soup (HK$78) seemed like the consensus “must order” dish – it was recommended by a number of trusted foodies online, as well as the guy at Winstons Coffee (I had an espresso martini before – HIGHLY recommended). They pour the soup over the raw shrimps, which cooks it a little. On the first sip, the broth-like soup was a bit underwhelming – I think I was expecting lobster bisque tastes – but it quickly absorbs the flavours from the shrimp and becomes intensely flavourful. It’s not at all like the western seafood soups – it’s much lighter in texture, yet strong in taste. It’s super interesting, it’s “nice”, and ultimately it’s hard to explain. A friend also suggested the Fried Chicken Cobia (HK$258), which is actually deep fried yellowtail. The batter was exactly like southern fried chicken and this was served on top of a bed of Japanese-y sauce – I think it was miso garlic. The contrast in taste and texture was so stark and worked so well. It was hands down our favourite dish of the night. 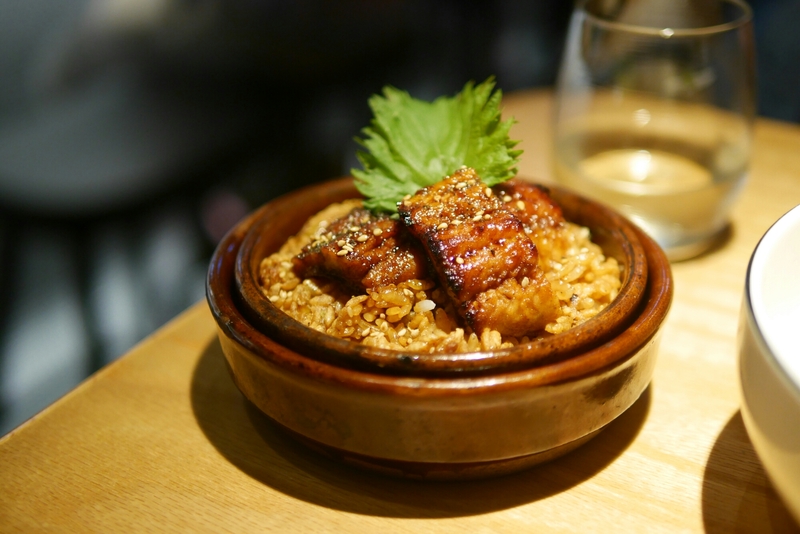 We also ordered the Unagi Fun (HK$168), eel rice which was also recommended (according to my research). The rice was nicely coated in sauce and had a nice smokey stonepot taste. It was pretty delicious but the portions were pretty small. The only disappointment here is that they don’t really do desserts here. We got the custard banana which was just baked banana. Bottom line: This was a pricey meal and at HK$500 per person, I wasn’t really full. But it came with a LOT of good surprises. The dishes are definitely unique. So I thought it was worth the experience. Vanimal serves 100% vegetarian food, but it’s not going with the raw organic concept or serving bland healthy food. It’s interesting even for a meat eater. That was a huge selling point because I am often searching for places to dine with vegetarian friends… And it’s always difficult to come up with vegetarian-friendly options, where my friends won’t end up eating just side dishes of veggies. Another big plus was the cocktails. They were pretty outstanding and interesting. They also have a good ambience for a small group of friends – comfortable seating and not super loud. 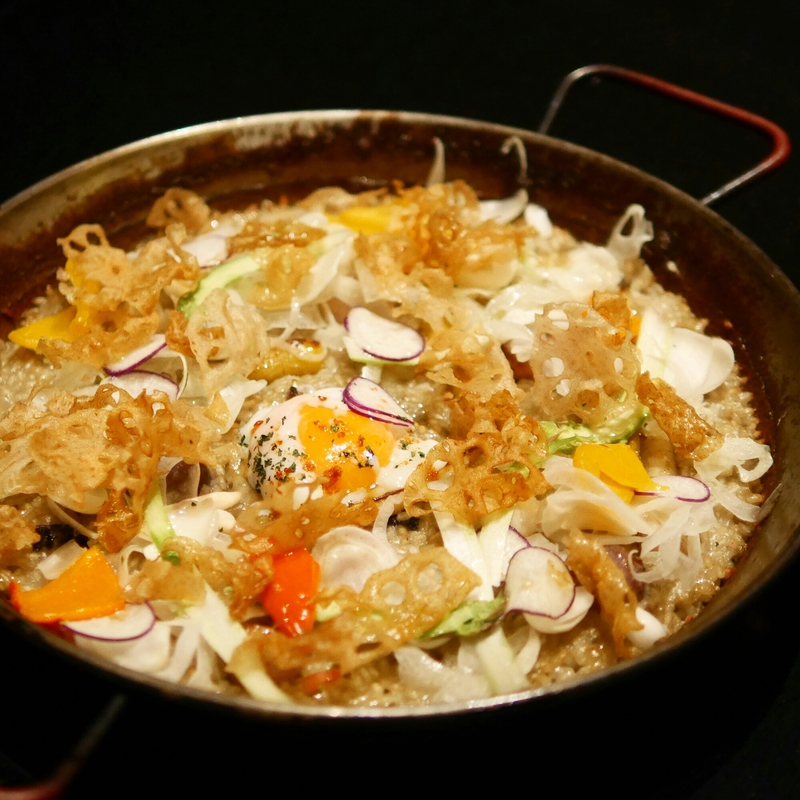 The food: The Vegetarian Paella (HK$368) was probably the most unforgettable dish of the night. Vanimal doesn’t necessarily do Spanish food – so I don’t think we should be expecting ‘authentic’ flavours at all. But the rice was super flavourful in Vanimal’s own way, and also very al dente – which is a must for me. It was topped with a variety of veggies which were all really sweet and delicious. I’d also equally highly recommend the Shitake Brie Crunch (HK$78 – I think) with green salad. It was essentially shitake inside a thin crunchy mini grilled cheese sandwich. The brie flavours were strong and these were just so addictively delicious. On the other hand, the dual potatoes with aioli featuring normal and sweet potato wedges were a let down. They looked good on photos but I thought they were a bit too normal and not too flavourful. There weren’t many options for desserts but the chocolate dessert sounded so droolworthy, we wouldn’t have choosen anything else even if we had a choice. 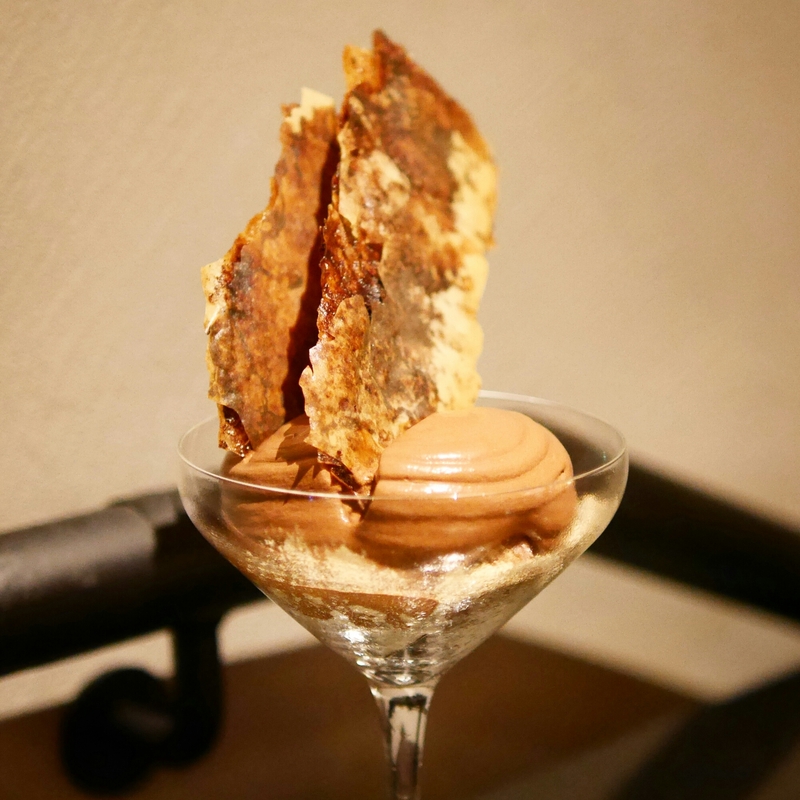 The Chocolate 5572 (HK$108) was essentially chocolate mousse atop brownie bites and topped with a flakey chocolate pastry. The mousse was surprisingly super light and airy, which meant that although the dessert was super chocolate intense, it was not too filling or heavy either. Bottom line: It’s hands down the best vegetarian dinner I’ve had in Hong Kong. Even if you’re not a vegetarian, there’s a lot going on for a meat eater to enjoy, especially the cocktails.